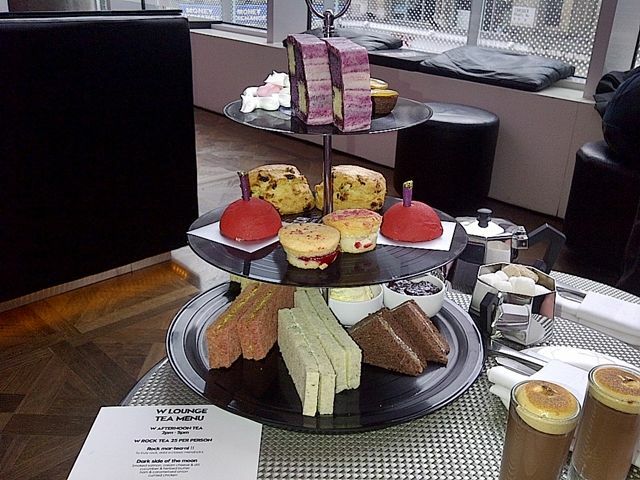 On Sunday I went to the W Hotel in Leicester Square for a spot of Afternoon Tea. One of my friends was visiting so it was the perfect opportunity to enjoy some great food and have a girly catch up. I had also acquired myself a 2 for 1 voucher from Emerald Street so it was even more of a perfect excuse to indulge! 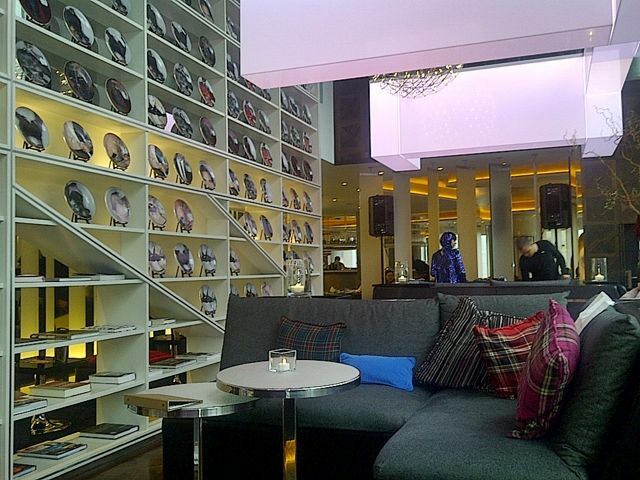 The W Hotel in Leicester Square is SO nice, you really have to experience it rather than listen to me describe it. 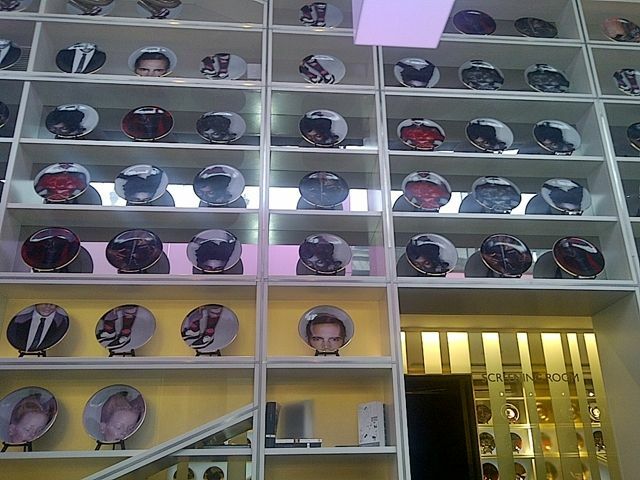 As you walk in you can’t help but notice the padded walls as you come out the lifts, there are disco balls hanging from the ceiling and an array of plates on high shelves with faces on. We were seated in The Library, which is a cosy section made up of comfy booths with tartan cushions and a great view over Leicester Square. Behind this seating was the bar which was very busy even though it was 2.30 on a Sunday. There was also a DJ wearing a sparkly sequinned blue dress and hat. She was playing some great tunes and I sort of felt a bit confused, like I had been out all night. 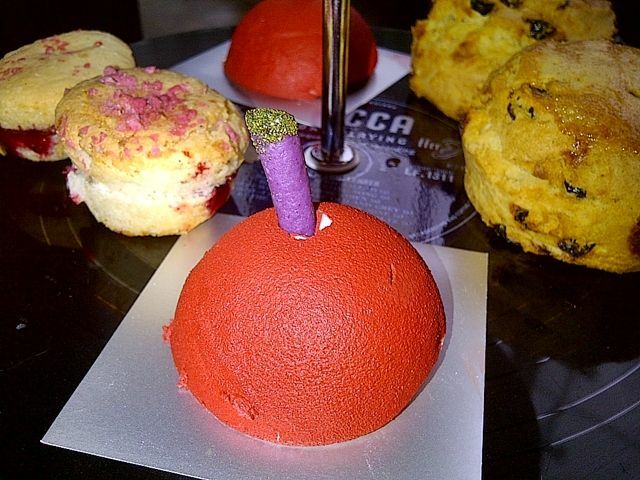 Afternoon Tea at the W is called the ‘Rock Tea’ , this is because all of the treats are named after rock songs and albums. 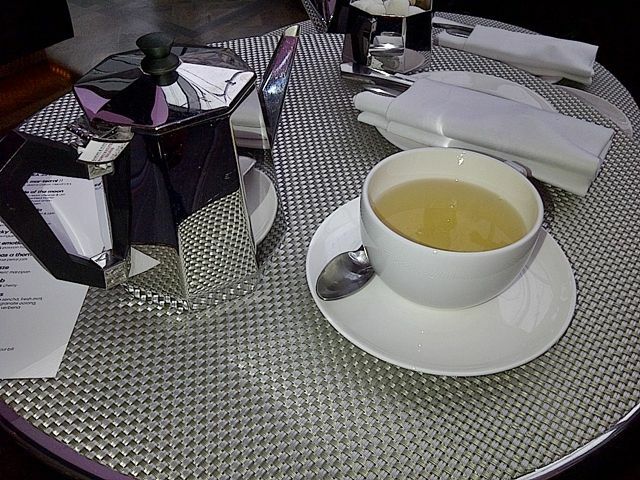 I opted for pomegranate oolong tea and Michelle went for the Mint, I guess not so rock ‘n’ roll. 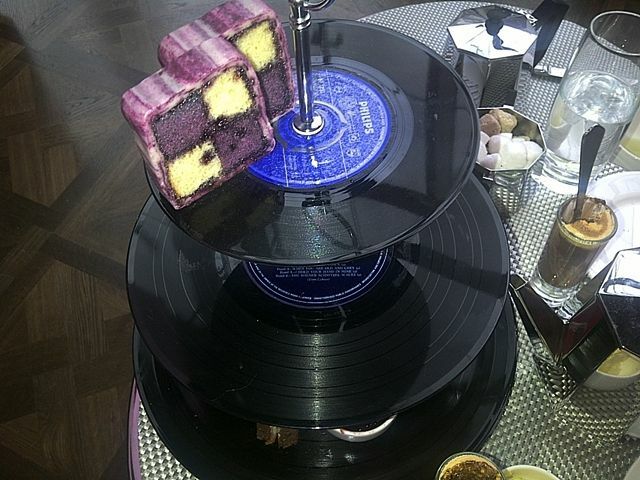 The tea was presented on a plastic cake stand of records, a really nice touch. 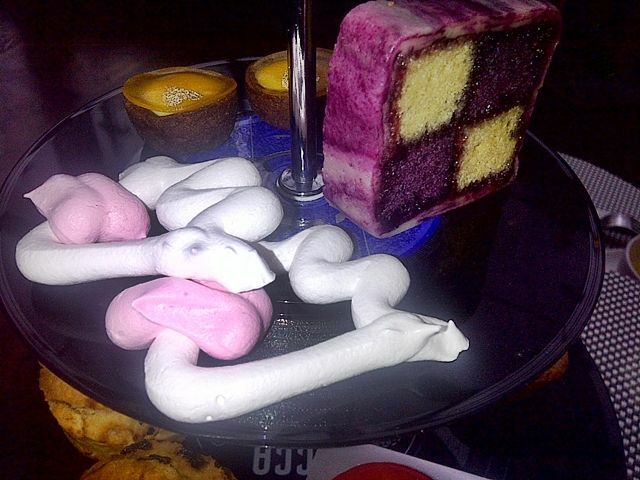 There was so much food to get through and my eyes were widening at the array of cakes on offer. We started with the sandwiches, my favourite was the cucumber and herbed butter. 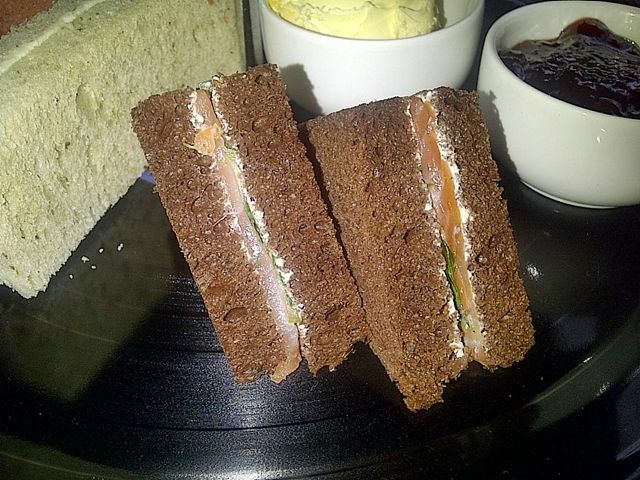 I’m not keen on salmon but Michelle said these were really nice despite the dark brown bread which confused me as it looked like chocolate. The next layer up included Rule Britannia, Every Rose Has A Thorn and Cherry Bomb. Otherwise known as fruit scones with clotted cream & jam, rose financier with rose petal jam, and a chocolate, mascarpone and cherry bomb! These three were all lovely, the Cherry bomb was not what I was expecting at all. It was super soft, sort of mousse like texture with a chocolate base. Next up I opted for the Chocolate Pudding which was hazelnut crunch and chocolate mousse, by now I’m pretty stuffed but we still had one more layer. 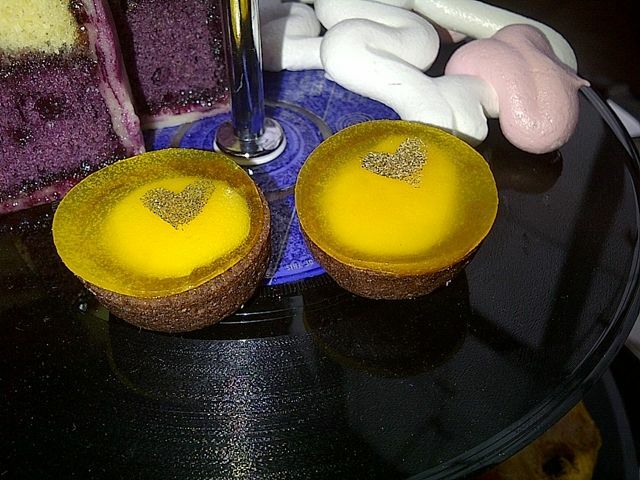 What caught my eye were the Sweet Emotions, a small circular dessert which had a chocolate base and a delicious passion fruit topping, complete with an edible glitter heart. Anything with glitter gets a plus in my books! It was super yummy and had me wanting more. I then tried the Sticky Fingers which was vanilla meringue with attitude apparently, also delicious! To finish off there was a Victoria Sponge with Marzipan. We both had a great time, the W Hotel has a great chilled out atmosphere and the food was lovely. The only complaint I had was that the service was quite slow and could have been slightly more attentive, as we struggled to grab the waitresses attention to get some water when both our teas had run out. However the good company and food made up for that. Definitely worth a visit!